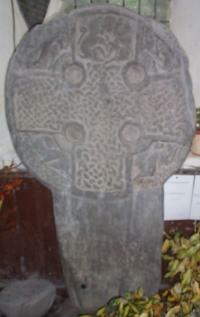 This cross is Anglican work from around 800AD, measuring about 5ft high. 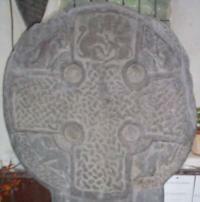 One side bears a equal limbed cross with connecting ring. In the upper limb, centre panel, there is a representation of what some believe is Daniel in the Lions Den, though others see the Celtic theme, or Jaws of Hell. Carefully designed and carved plait work and dogs have been carved into the cross limbs.